Start dates are as flexible as possible whether your break is a long or short one. A minimum stay is two-three nights. Your holiday starts at 4pm on arrival day and ends at 10am on departure day. 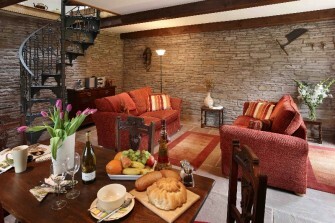 Our 4 night weekday breaks are often the same price as a 3 night weekend, please enquire. At Christmas and New Year and Hay Festival the minimum holiday length is 5 nights. Please always ask us if you cannot see your specific dates on the calendar, we may be able to offer you another cottage. Prices are fully inclusive, they vary depending on season, but we often have special offers available. You can check the cost of your proposed stay by checking the Check Availability page on our secure booking link with SuperControl. The grid will show you what dates are available and the associated prices. Bookings can be made online, by phone or email. We accept payment by cheque or bank transfer, credit and debit cards. The payment link is through a secure link to Holiday Rental Payment in the UK. A booking is confirmed when you have paid us one third of the total fee as a deposit. The final balance is due 1 month prior to your holiday. We will acknowledge your payments – usually by email, and send you Travel Directions and Cottage Information. A Refundable Security Deposit of £200 against damage and excessive cleaning is payable when 2 or more cottages are booked together. This is payable with the final payment. We will ask for a complete list of all the guests in your group as well as the names of any day visitors. 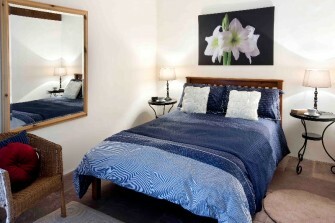 At Holt Farm we accommodate only those persons you have told us about and sleeping only in the beds we provide. 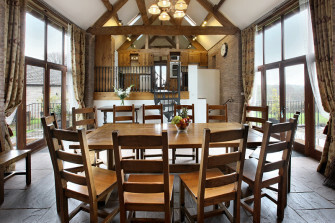 A charge of £15 per person per day is made for day visitors to Holt Farm. Greater charges apply if day guests have stayed overnight. 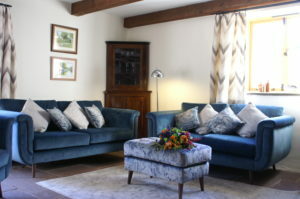 All our cottages are prepared individually to suit your requirements before your arrival. Holt Wain House is fully accessible for less able visitors and wheel chair users. We have an additional raised toilet seat with arm rests and a free-standing or wall mounted shower seat in the wet room, the sink is wheelchair accessible. Please talk to us about your requirements. Comprehensive Local information Leaflets are in each cottage, as well as maps and local walking routes. More can be accessed from our Walking World subscription, please ask. Gas hob ( 2 ceramic hobs in Holt Barn), electric oven, fridge freezer, microwave, dishwasher, washing machine and drier, a generous supply of crockery, glass wear, cooking utensils, serving dishes and cutlery. 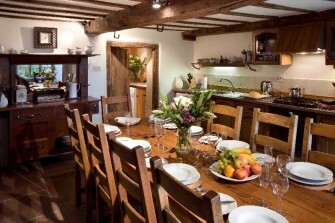 A basket of children’s plates, bowls, cutlery & mugs is in each cottage. All bed linen, mainly pure cotton sheets and duvet covers, 10tog duvets, [some feather, some man-made content] A top sheet and blankets are available upon request. All year round – we have two 7 seater outdoor Hot Tubs. They are on the Farm House patio and at the Wain House, both have child safety locks. Our cottages have large flat screen televisions, Freeview, DVD player, stereos with ipod docks, selection of DVD’s, board games, puzzles, books, toy box. Your deposit is non-refundable. We recommend Booking Protect holiday insurance, particularity if you are booking for a large group. If booking online this will show as a tick box option. It is the hirer’s responsibility to ensure suitable Personal Holiday Insurance cover in respect of cancellation or curtailment is in place.